Earn $10.00 in VIP credit (1000 points)What's This? The Transition Bag from Blue Seventy provides the practical and organizational race-day support that dedicated triathletes need, making it the ultimate race-day game-changer. 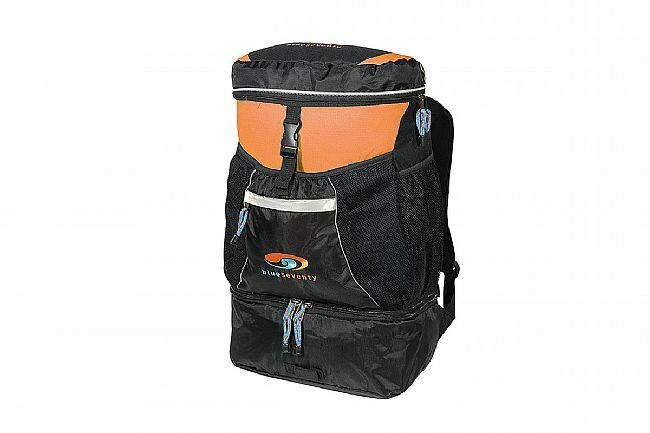 With triathletes in mind, this backpack was designed to accommodate the diversity of gear they tow to each competition. On the top of the pack, there’s a soft, micro fleece lined pocket that provides protection for fragile items like sunglasses and goggles. For wet gear, the bottom of the pack makes up a 32-Liter waterproof, insulated compartment that ensures dry gear stays dry and wet gear doesn’t drip soak the rest of the cargo. There are four smaller zippered pockets for secure storage of anything from nutrition to a change of clothes. Two expandable side pockets are ideal for water bottles or shoes. An elastic compartment on the front panel is designed specifically for helmets but can be used for whatever makes the most sense to you. There’s even a padded interior sleeve for a laptop or Kindle. If your event is nearby and you’re biking to it, this pack has a narrow padded back panel and cushioned shoulder straps that make it easy and comfortable to carry on your back whether you’re riding your bike or hiking down to your favorite open water swim training spot. Insulated & waterproof bottom compartment. Elastic front compartment with reflective details. Protective micro fleece top pocket. Raised foam padded back and straps.